Q. How is the media industry changing today? The media industry, especially the digital TV industry, is going through some revolutionary changes both in terms of how video is delivered and how it is watched. Until a few years ago, consumers watched TV programs that were delivered via a dedicated and controlled network. Content was aggregated and delivered to viewers via cable or satellite to set-top boxes on the consumer side. Now, viewers are increasingly shifting toward watching content when they want, where they want, and on the device they want. Content is streamed per user requirements, on demand, and in the resolution supported by the playing device. Another reality is that video quality and viewing experience matter greatly. If video is interrupted, or has poor picture quality, customers are going to abandon the service and seek other alternatives. It's a total shift in control, with content now being requested by consumers according to their preferences. These trends have pushed the industry to come up with new, innovative technologies and standards such as ABR, HEVC, 4K, MPEG-DASH, etc. To be competitive, video service providers will need to offer or expand OTT content, as the case may be, and add these new technologies into their existing infrastructure. Q. What is the difference in streaming in OTT Workflow for VOD vs. live streams? In both cases, whether live or video-on-demand (VOD), segments for every profile that is created are made available on the origin server. However, there are some differences. With VOD content, the segments remain static whereas with live content, each segment is uploaded in real time after it is encoded. After that, the provider also has to take additional steps as to how to manage the elapsed content - whether to keep old segments on the server for later viewing or not. There are a couple of other points that service providers need to keep in mind, especially when they are considering QC and monitoring tools. Broadcasters store and manage a large number of VOD assets. In a file-based workflow, they have the time and luxury to go through each asset, analyze the quality and, if required, take corrective actions to fix the issues. For live ABR delivery, relying on the ABR transcoder to produce error-free streams would not be wise. You need to have monitoring systems that can look at multiple manifest files simultaneously and provide alerts in real time for both errors and quality issues. 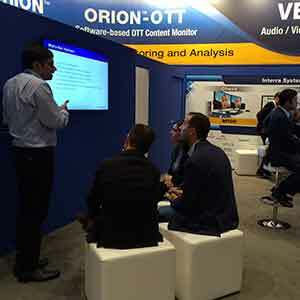 ORION¢OTT is a software-based, over-the-top (OTT) monitoring solution for checking content integrity and related network performance of ABR content for multiscreen service delivery. ORION-OTT is designed to help customers deliver content with superior Quality of Service (QoS), and Quality of Experience (QoE). It's a software-defined product which can run on any industry-standard server and can monitor hundreds of manifest files on a 1 RU server. We have designed the product to address scalability and high-density requirements. While traditional manual monitoring methods are too time-consuming, expensive, and unreliable, and hardware-based monitoring solutions make it difficult to keep up with the rapid pace of new video formats, protocols, and monitoring enhancements, ORION-OTT absolves these issues, guaranteeing the highest level of QoS and QoE for live and VOD OTT services. Q. Can you explain how ORION-OTT works? A typical scenario would be ORION-OTT running at the post origin server point in the workflow. Based on user defined automated or manual schedules, it looks at every asset to check for errors and generates alerts and reports in real time. It will also check for inconsistencies pertaining to ABR package compliance, manifest/playlist syntax, download errors, audio video quality, etc. User can get in-depth reports regarding errors, which can be used to troubleshoot problematic issues. The web-based interface of ORION-OTT allows remote monitoring through any browser-enabled device, giving users a comprehensive monitoring and reporting tool at their fingertips. Q. What types of checks are essential for ABR content delivery? Video service providers will want to look for baseband quality; compression artefacts such as macroblocking, pixelation, ringing artifacts, etc. ; and standards compliance checks. Then there are ABR checks such as segment start time, alignment of variants, consistency between metadata and actual content, etc. It is also important to make sure that the monitoring tools support a wide variety of formats such as Apple HLS, DASH, SmoothStreaming, H.264, Closed Captions, etc. Q. Can OTT monitoring solutions be used for both real-time and VOD/linear environments? Yes, in fact a good OTT monitoring solution should support real-time, VOD, and linear workflows. They can be quite effective for post-origin server, content delivery network (CDN), and cache server monitoring where QoS checks such as availability of URLs, download time, and latency checks are more important. At the post-origin server, CDN, and edge server locations, broadcasters will want to focus more on HTTP checks. Having a high-density, high-performance monitoring platform will ensure proactive monitoring of large volumes of content. Q. What kind of problems should an OTT monitoring solution address at the content delivery stage? During the content delivery stage, you need a solution that checks for availability of content and comprehensive HTTP checks such as content download time, latency, etc. These checks fall under the category of QoS assurance, and are deemed critical for OTT delivery. Basic quality checks such as freeze frames, black frames, etc. should also be part of the monitoring at this stage. Audio checks such as loudness, silence, and levels are also important. In an OTT workflow, content is stored on origin servers, CDNs, as well as edge/cache servers. Depending on the location of the end user, bandwidth availability, and other factors, video is sent from one of these servers to the end user. QoS problems can arise at any of these delivery points, and content providers will need visibility into the entire workflow to ensure optimum QoS and QoE. ORION-OTT helps address these critical OTT delivery requirements through centralized management, checks of QoS and QoE, and real-time error alerts for problem detection and troubleshooting. Q. How do you at Interra Systems stack up against the competition? There are several differentiators. First of all, Interra Systems products are software-centric solutions. Our customers prefer the flexibility of using their own IT-approved servers. Secondly, our solutions feature a multi-threaded, multi-core architecture for optimum performance, scalability, and flexibility. We have made remarkable advances with regards to performance, which puts us ahead of the competition. With ORION-OTT, customer gets a powerful and cost-effective monitoring solution - not just high level compliance checks but also accurate audio-video quality checks that will help assure better QoE for viewers. The software-centric approach and architecture makes it possible for customers to scale and expand the monitoring scope as they add more content. With a combination of Interra's BATON for file-based QC and ORION content monitoring platform, we are able to provide a comprehensive, end to end quality control and monitoring solution for both VOD and live conent.